Mocno zakorzeniony w Stanach Zjednoczonych, od 1925 roku, Dunn-Edwards Paints® rozpoczął się jako mały, rodzinny biznes — który dzięki ciężkiej pracy i zaangażowaniu na rzecz jakości — stał się jednym z największych niezależnych producentów farb i materiałów malarskich. Realizujemy z poświęceniem naszą misję aby zapewnić profesjonalistom i konsumentom najwyższej jakości, przystępną cenowo, kompletną linię farb, narzędzi i dodatków malarskich — a także najwyższą jakość obsługi. I robimy to z dumą. 01 Paints proven to look better and last longer. We spend a lot of time testing paints — both ours and our competitors’. Our paints are formulated to offer superior performance, and we have the tests results to prove it. If you need superior adhesion and hide, look no further than our EVEREST® and EVERSHIELD® lines of ultra premium paints. EVEREST®, the best paint we have ever made, is a low odor, Zero VOC interior paint that applies easily and provides exceptional stain resistance and washability. EVERSHIELD® offers ultra low VOC, while providing maximum exterior protection. What does this mean for you? These products offer high-performing, durable finishes that help ensure your project turns out beautifully. 02 The perfect color every time. Dunn-Edwards knows color is critical. That’s why Perfect Palette ® — our proprietary color system that is preferred by paint and design professionals — offers you 1,996 colors to bring your vision to life. Perfect Palette ® features user-friendly color selection tools, making it easy to pick the right colors. And, just to be absolutely sure, you can test your colors with our 8-oz. Perfect Palette ® Sampler paint samples. Need to match a fabric, flooring or window treatment? We can match it, as we have the best tinters in the business. And, we use unique Zero VOC colorants, so our paints provide better hide, richer colors and lasting durability — with minimal environmental impact. 03 The #1 choice of professionals. Ask any professional painter, and they’ll tell you. Dunn-Edwards has always had an excellent reputation among experts who really know their paint. In an independent survey, licensed painting contractors were asked which paint they would use on their homes. The overwhelming choice? Dunn-Edwards. In fact, more pros chose Dunn-Edwards than all other brands combined. * The reason? Superior quality. 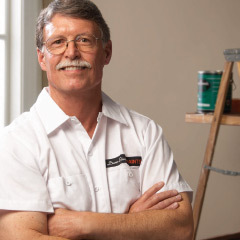 Those who know paint best know Dunn-Edwards outperforms and outlasts all other brands — putting us in a class by ourselves. In another independent study, we asked nearly 500 interior design professionals which color system they specified most. The pro’s choice — by far — was Dunn-Edwards,** and designers love our Perfect Palette ® color system. * Based on an August 2009 survey of licensed painting contractors in the Los Angeles, San Diego and Phoenix areas, conducted by Options Market Research. ** Based on a May 2012 survey of interior design professionals in the Southern California, Northern California and Arizona areas. 04 Formulated to stand up beautifully in any climate. We have been successful by specifically formulating our paints to stand up to the diverse environments of the Southwest. Nowhere else in the world will you find such a range of challenging climates — from the harsh heat of the Mojave Desert, to the cold temperatures of the Sierra Nevada Mountains, to the salty air of the California coast. If a paint outperforms here, it will outperform anywhere! Unlike paint companies headquartered in the Midwest, East Coast or even overseas, our research and development are performed here — where we test our paints year-round. We know what ingredients work best in these conditions and formulate our paints for lasting performance and beauty. 05 Expert advice to make sure your job is done right. Our full-time staff of experienced product trainers is dedicated to translating the skills and knowledge of our world-class chemists to our representatives in the field so they can answer any question you or your contractor may have about painting. Need help selecting the right paint? Have an unusual paint problem? Ask us. We’re always ready to help. 06 Customer service with a difference. It is our mission to do whatever it takes to help get your job done right and on time. With more reps in almost every market, we are able to spend more time answering questions, assisting painters and being available to make sure your project goes smoothly. 07 Better ingredients make better paint. Dunn-Edwards offers only the finest products, ensuring that your paint project stays looking beautiful for years to come. We are committed to using only the highest-quality ingredients sourced from the best manufacturers (i.e., titanium dioxide, acrylic resins, color pigments, etc. ), and our industry-leading chemists formulate with these ingredients to create superior products. In addition, our quality specifications are among the most demanding in the industry, and our state-of-the-art, highly automated LEED Gold-certified factory ensures precise, batch-to-batch consistency. 08 A first-class job demands first-class supplies. Your finished job is only as good as the materials that go into the project. That’s why Dunn-Edwards only sells supplies and equipment from the most trusted manufacturers. When you walk into our store, you can feel confident that every item performs to the highest standards under the toughest conditions. We stand behind every product so you’re assured the best results possible. 09 A green legacy, a greener future. At Dunn-Edwards, our mission has always been to provide the best performing paint, in an environmentally sound manner to protect the health and well being of our customers. We have been a disciplined leader in the concept of green product manufacturing long before it was popular. From our ingredients to labeling to our LEED Gold-certified paint manufacturing facility, Dunn-Edwards has a legacy that makes us proud and inspires us to do more. 10 Over 90 years of success. Superior products. Knowledgeable paint experts. Dependable customer service. Proven long-lasting performance. That’s why so many paint professionals and consumers choose Dunn-Edwards time and again. And that’s why you should, too. As part of an ongoing commitment to ecoresponsibility, Dunn-Edwards earned the coveted LEED Gold certification from the U.S. Green Building Council for its state-of-the-art paint manufacturing facility in Phoenix, Arizona. The 336,000-square-foot plant was custom-designed to be the greenest, most efficient in the coatings industry. The ultra-modern building — which incorporates innovative, energy-efficient equipment and protocols — is the world’s first LEED-certified paint factory. It encompasses product development, manufacturing, quality-control laboratories, a distribution center, and a retail outlet and office space. LEED and related logo is a trademark owned by the U.S. Green Building Council and is used with permission.